Joint Matrix™ is a powerful, natural, and complete matrix of chondro-protective agents for joint, cartilage, and connective tissue support. Our glucosamine and chondroitin formula encourages cartilage regeneration and reduces the athletic aging of frequently stressed joints. These nutrients help prevent free-radical damage, improve joint circulation and lubrication, and improve response to injury. Improved Joint Health: Joint Matrix provides essential building blocks for healthy cartilage and ligaments, including our exclusive Triple Glucosamine plus Chondroitin formula of Glucosamine Sulfate, N-Acetyl-Glucosamine, and Glucosamine HCI. Chondroitin Sulfate is also included to contribute to strength, flexibility, and shock absorption of connective tissues. Support Cartilage Regeneration: Joint Matrix contains a synergistic blend of nutrients that inhibit enzymes that break down cartilage, including BioCell Collagen II®, a natural source of bioavailable, Hydrolyzed Collagen Type II, Chondroitin Sulfate, and Hyaluronic Acid. Collagen Type II is the most abundant protein found in joint cartilage that promotes new cartilage synthesis and reduces oxidative damage to joints. Hyaluronic Acid is an important nourishing agent that helps to retain the natural moisture content of skin tissue. Reduced Free Radical Damage: Includes powerful free-radical quenchers including, Curcumin Extract, White Willow Extract, Deer Antler Velvet, and Acetyl-Cysteine to help reduce the “athletic aging” of frequently used, over-stressed joints. Reduced Joint Irritation: Contains Bromelain, a powerful proteolytic enzyme which helps dissolve damaged joint and connective tissue, thereby clearing the joints to prevent further irritation. 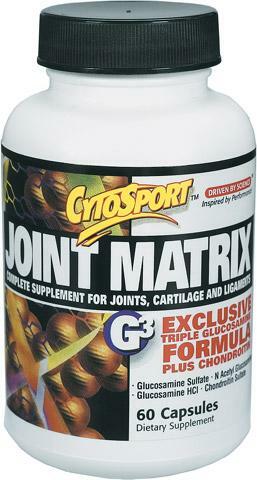 Buy JOINT MATRIX CAPSULES Now!